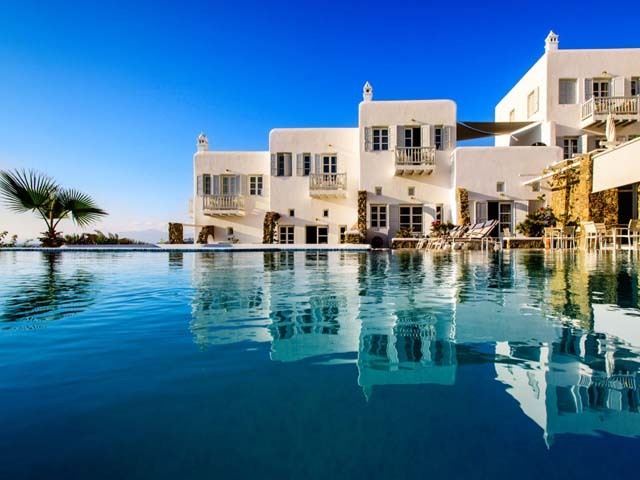 We are a proud member of Leading Hotels of the World and an exclusive address on Mykonos, poised on the foothills of Elia Bay, immediately above the aquamarine waters and famously fine sand of our private beach. Rising up from the rustic stone walls that anchor it into the gentle slope, the Imperial’s majestic white profile commands infinite views that merge almost imperceptibly on the horizon line. The same sense of spaciousness defines our accommodation and interiors – an oasis of white, offset by touches of warm wood and quirky design details. 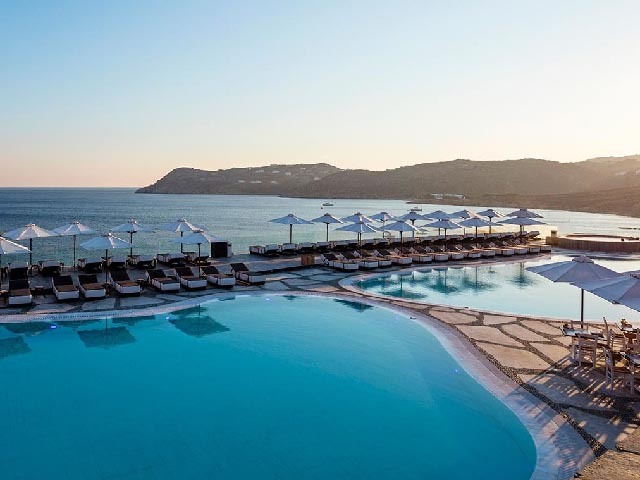 Everywhere, openings onto the expanse of sea and sky are invitations to move seamlessly between in- and outdoors, and discover the many secret lookouts, the luxury spa, our gourmet restaurants and the entertainment deck with its seawater pool and seductive bars. The Imperial is a choice destination for island-hopping honeymooners and young couples who seek laid-back luxury in a beautiful natural setting that is a short ride from the island’s exciting nightlife by complimentary shuttle. 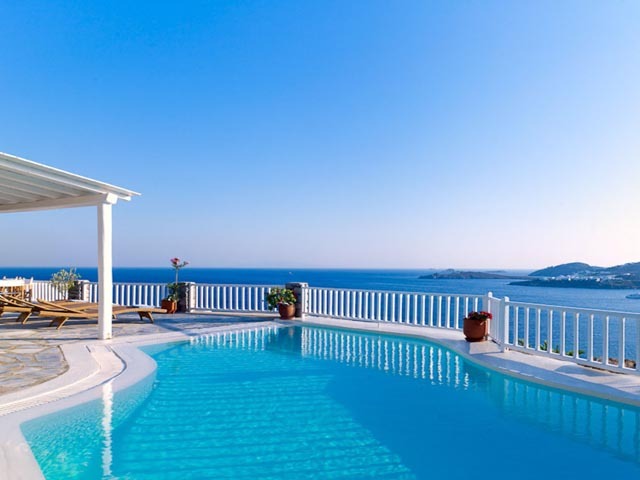 Yet we are equally fond of our extended families who return to their holiday home thanks to friendly staff that considers the comfort and wellbeing of each individual guest. 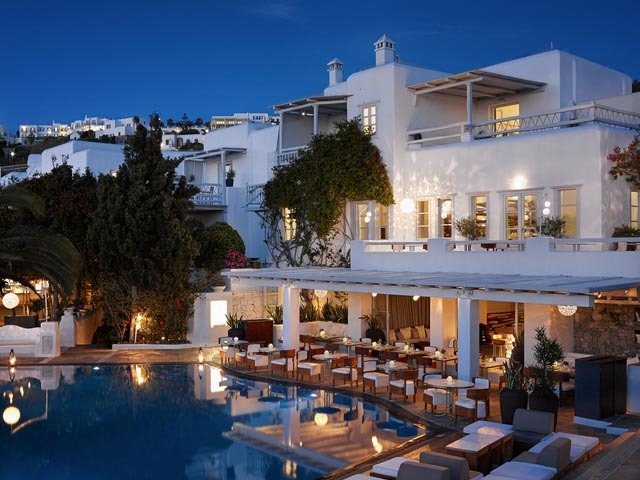 Offering the highest standard of service in a setting renowned for its contrast pleasures of natural beauty and man-made revelry, the Imperial lays claim to a choice spot on one of the world’s foremost cosmopolitan island destinations. 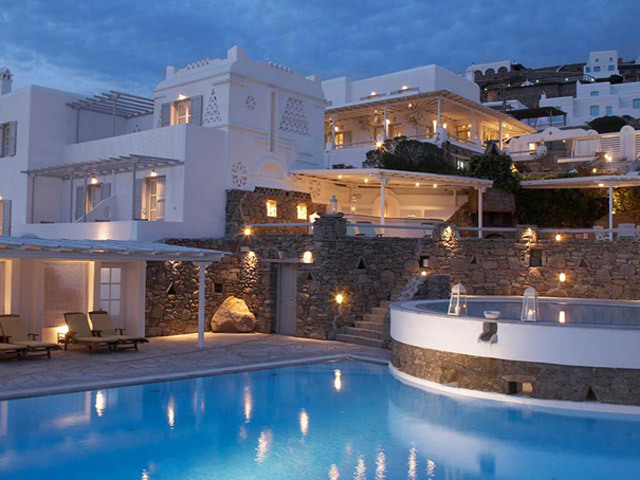 Nestled on the headland of Elia bay, crowned by rocky crags that fall in a gentle slope towards the broad swathe of beach popular for its fine sand and pristine waters, it is equally a stone’s throw from the pleasures of Mykonos Town by complimentary shuttle. An exciting variety of watersports are offered by an independent contractor with the assistance of experienced professional instructors. The equipment includes water-skiing, air-nautique, a parachute boat as well as six 4-stroke Yamaha Jet skis. 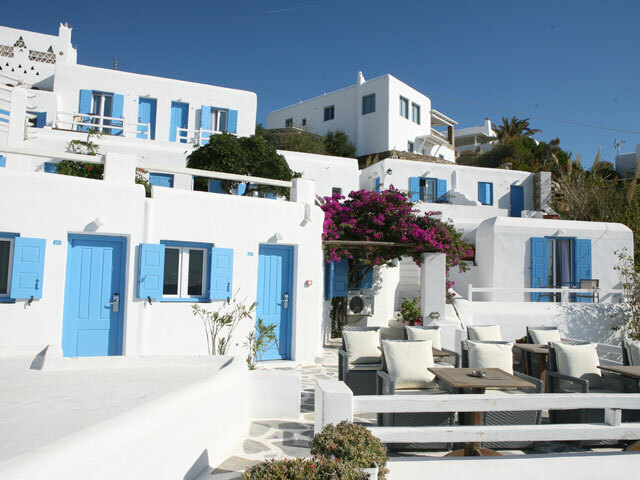 Boat tours to explore the coastline, and ferries to the neighbouring islands depart from the town harbor. A mere half hour away, you will discover one of the most important mythological and archaeological sites in the Mediterranean, the famous ruins of Delos. 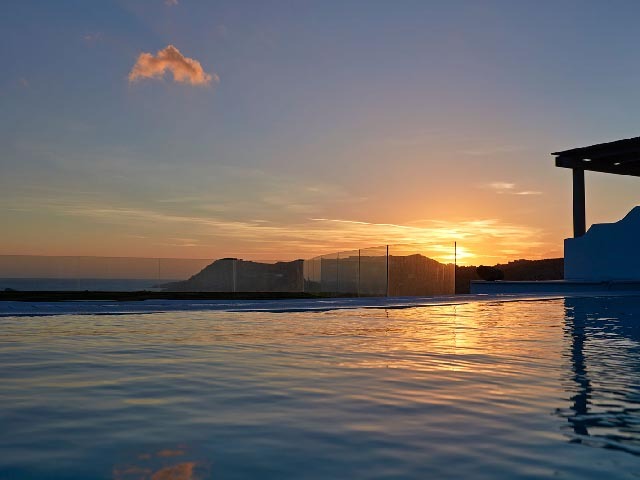 Enjoy compact luxury in a 28m2 space with sea views that is artfully appointed with every comfort, a king-size or twin beds, and a bathroom with shower or tub, stocked with luxury toiletries. Ideal for two adults. Expect a tranquil oasis replete with sophisticated comforts: 40-45m2 that includes king-sized or twin beds, a lounge area, and bathroom with tub and shower – adjoining a balcony with private pool and sweeping sea views that invites to moments of undisturbed relaxation or intimate sundown gatherings. Enter a world of ultimate indulgence with the Imperial’s most exclusive 55m2 space. 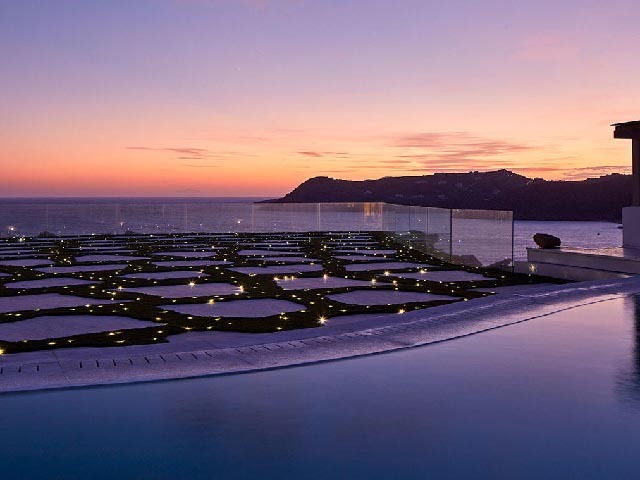 Give yourself over to the wildly romantic nonchalance of perfect moments spent drifting between the comforts of luxurious interiors and the sun-soaked private terrace with its infinity pool and captivating sea views. 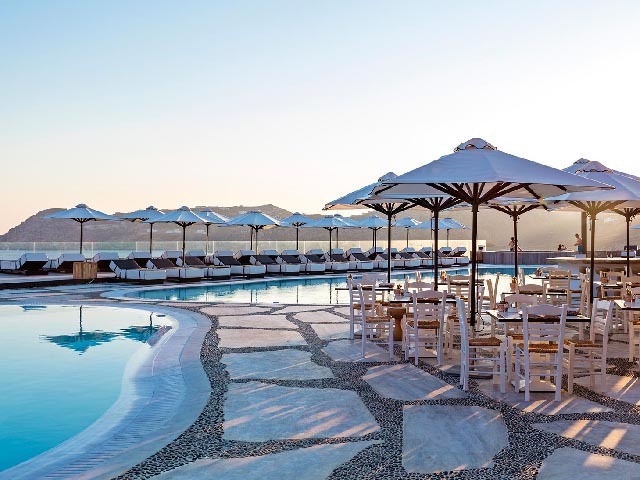 Named after the warm Etesian wind, Meltemi rises to the occasion of each Myconian morning with sweeping sea views and a bountiful array that transforms breakfast into the first of many feasts to be enjoyed throughout the day. Awaken your senses with fresh coffee, pick your preference of eggs à la carte and choose from a hot buffet, selection of freshly baked breads, fruit platters, cured meats, Mediterranean delicacies and a range of cereals. Special requests and gluten free requirements are naturally taken into consideration. Dine among the stars at the Imperial’s à la carte restaurant – those suspended in the heavens above, as well as the world famous Mediterranean delicacies artfully prepared by our head chef, using locally grown, seasonal and organic produce. Rumor has it that the seafood risotto and the calf fillet with wild mushroom are truly stellar culinary experiences. The art of sushi – Japan’s gift to global cuisine – is honored here with an array of traditional classics, as well as imaginative fusion dishes created by our chef from the freshest catch hauled in at the first light. Discover his signature dishes while enjoying the gentle breeze that caresses this open-air bar with breathtaking views across the bay. Indulge in the perfect vacation fantasy as you sip one of the delectable concoctions mixed by our Nostos barmen, take a plunge in the seawater pool to cool off from the Aegean sun and the warm breeze, enjoy light snacks served in the shade of your lounger as you drift in and out of daydreams, losing all sense of time until sunset turns the page to the glittering nightlife. 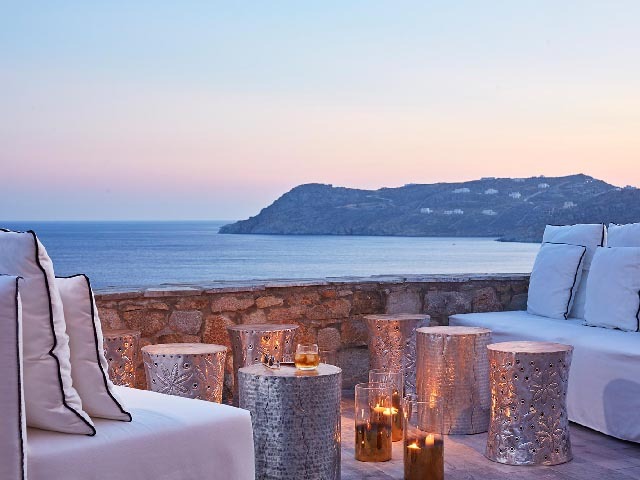 The Veranda bar sets the stage for idyllic moments…a seductive invitation to pause and take in the views of the vast Aegean and the endless skies set ablaze by a fiery sunset, just long enough for the mischievous archer to hit his mark. 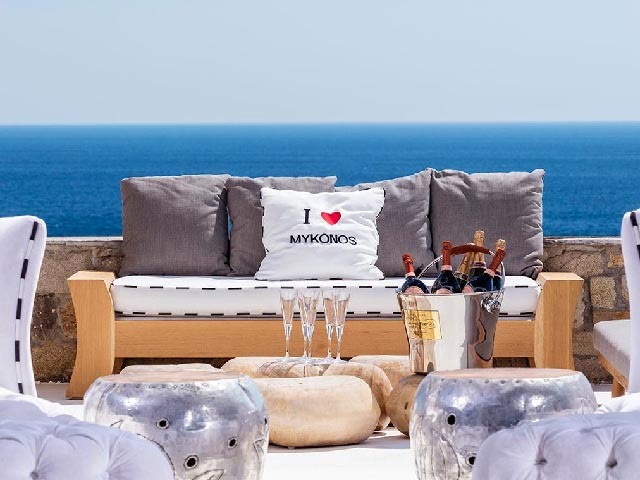 You may fall a little more deeply in love with Mykonos, as you raise a cool cocktail to the simple pleasures of life that are there for the taking.